Depending on your relationship with your interior designer and general contractor, we can help you with the creation of a design palette. 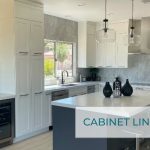 In fact our Palm Desert studio features a number of sample design palette boards of cabinet doors juxtaposed with counter tops (link) and backsplashes (link). These are the major elements of the ensemble. Please follow the links for more information on the options available to you. Please visit our studio to mix and match sample cabinet doors with sample counter top, backsplash and floor tile material to see what combinations of color and texture might work for you. We can also refer you to top rate fabricators and tile setters, who will bring the highest quality craftsmanship to the job. Or, through our sister in-house general contracting company, we can coordinate the entire installation of cabinetry, counter top and backsplash, including plumbing and electrical elements.